The chairman of the Senate Committee that investigated Planned Parenthood during the summer wants contempt proceedings brough against the Organization’s St. Louis President and CEO, and the owner of the third-party company that examines fetal remains after abortions. Senator Kurt Schaefer says Planned Parenthood St. Louis President and CEO Mary Kogut and Dr. James Miller of Pathology Services, Inc, were issued subpoenas to testify before the Senate Interim Committee on the Sanctity of Life but neither appeared before the committee, nor did they produce documentation the committee requested. Miller testified to the House Committees jointly investigating Planned Parenthood, in October. An attorney for Planned Parenthood has questioned the validity of the Senate’s committee on Planned Parenthood, whether it has the power to issue subpoenas, and whether its request for information from Planned Parenthood was clear enough. Planned Parenthood also maintains that supplying the documents requested, regarding incidents in which women left Planned Parenthood’s St. Louis Clinic in an ambulance, among other things, could violate patient confidentiality law. In addition to recommending contempt proceedings, the report says the committee should continue meeting through the end of the 2016 session. The report is signed by all of the Republican senators that sit on the committee, but not by the two Democrats – Senator Jill Schupp and Senator Maria Chappelle-Nadal. The Senate committee held four hearings after a series of videos began to emerge alleging Planned Parenthood had illegally profited from the sale of fetal tissue. 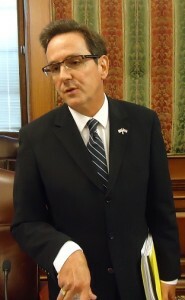 Planned Parenthood has dismissed the committee and its hearings as political grandstanding, noting that Schaefer is running for Attorney General.